I love Mexican food and can’t pass up on an opportunity to enjoy delicious chicken fajitas! Unfortunately most classic Mexican dishes contain several ingredients that are common food sensitivities (ex: cheese, sour cream and wheat or corn tortillas). 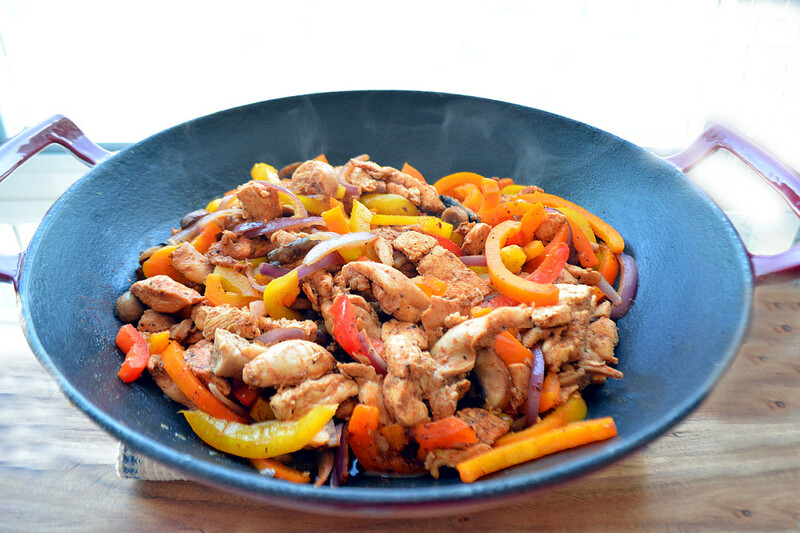 This chicken fajita recipe contains all of the flavour and satisfaction of those classic recipes, but you get to skip the belly bloat and fatigue that often otherwise follows! I made this recipe last weekend because I was craving a meaty, filling and satisfying meal that was still fresh and delicious. Pairing these chicken fajitas with a fresh, homemade Tropical Mango Salsa and a generous dollop of Simple Spinach Guacamole will have your tastebuds tangoing! I made this recipe last weekend because I was craving a meaty, filling and satisfying meal that was still fresh and delicious. These chicken fajitas did the trick, and topping them with homemade Tropical Mango Salsa and a generous dollop of Simple Spinach Guacamole will have your tastebuds tangoing! There are several options on the market for gluten-free tortillas, which you’ll be able to find at your local health food store. 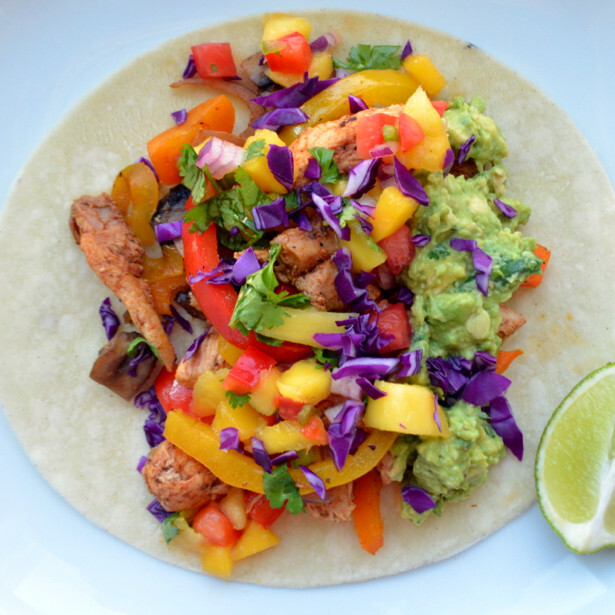 If you tolerate corn, organic corn tortillas are a tasty option and tend to make sturdy wraps. If you aren’t certain whether you tolerate gluten-free grains like corn, doing an Elimination Diet is a great way to identify all of your food sensitivities! Corn sensitivity is common in those who are sensitive to gluten, although many people don’t realize it’s impacting their health until removing it from their diet and then later testing it for symptoms. I like to experiment with using different kinds of tortillas, and this time I used brown rice and navy bean tortillas that I purchased from a local health food store. To be honest, it’s tricky to find good gluten-free wraps and unfortunately they often fall apart quite easily if you overfill them. If you have any favourite brands or varieties, please let me know in the comment section below! If you prefer to avoid grains altogether, you can enjoy “paleo” style fajitas by using romaine or iceburg lettuce instead of a tortilla. The chicken fajita mixture is also delicious on it’s own, simply topped with guacamole and salsa. Another light and delicious option is to serve the chicken fajita mixture with salsa and guacamole over a bed of spring mix greens! Let me know how you enjoy this recipe! 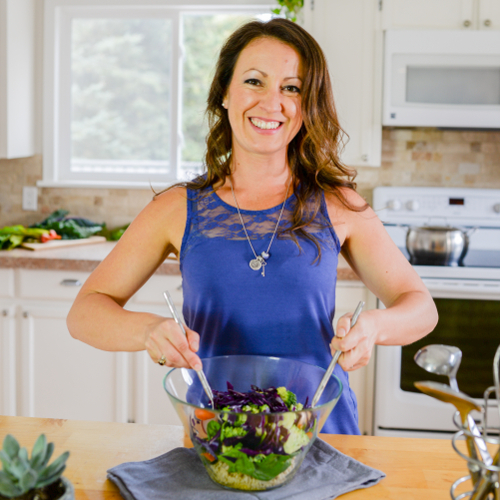 Take a photo and tag #healthyliferedesign on Facebook, Twitter or Instagram so I can see how your meal turns out! Slice chicken into strips and combine with the lime juice and 1tbsp of the chili powder, ½ tsp cumin, ½ tsp herbamare or sea salt and ½ tsp black pepper in a large bowl or Ziploc bag. Optionally you may allow the chicken to marinate in the spices for up to 24 hours or you may cook it immediately. 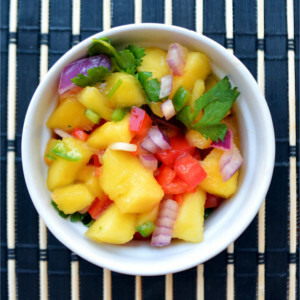 Prepare a batch of Tropical Mango Salsa and Simple Spinach Guacamole. Heat a large skillet over medium heat and grease with 1-2 tbsp of oil or ghee. Add the chicken and cook until no pink remains (approximately 10-12 minutes, flipping at least once). In a large wok, heat 3-4 tbsp of ghee or avocado oil over medium heat. Add the onions, mushrooms, garlic and remaining spices and cook for 3-4 minutes before adding the bell peppers. Cook an additional 2-3 minutes and then add the chicken to the wok and remove from heat. 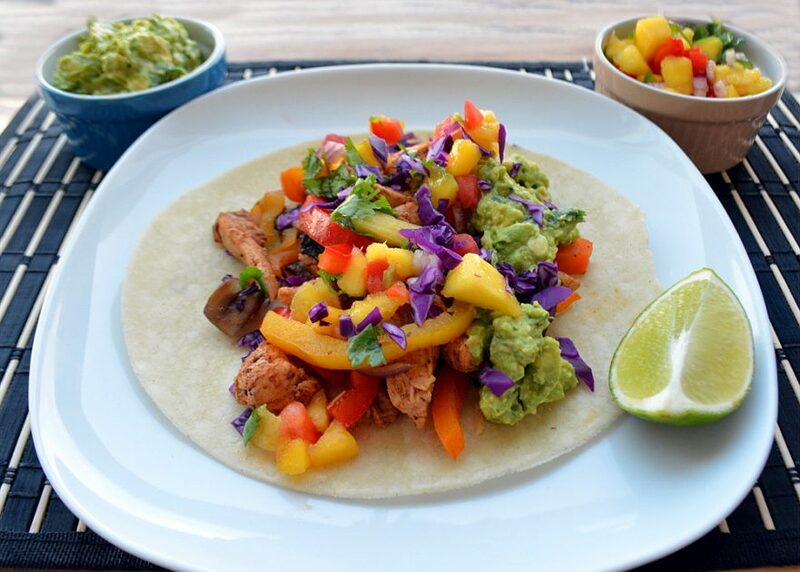 Prepare your fajitas by adding the vegetable and chicken mixture, mango salsa, guacamole and optionally a sprinkle of the purple cabbage to each tortilla. Store leftovers separately in the fridge and make the fajitas only immediately prior to serving. I share your frustration with finding good gluten-free tortillas! I usually just omit the wrap and enjoy the contents. Yours look delish! Thanks Elaine! That’s been my typical go-to solution lately as well. These look so fresh and colourful, and I always love dairy-free. Thanks for the great recipe! Thanks Colleen! I hope you enjoy the fajitas and salsa! Agreed, Samantha! 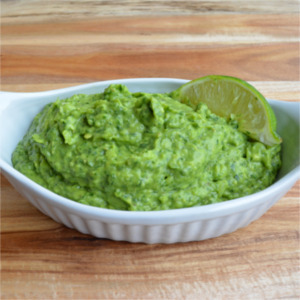 It’s definitely the additions like the homemade salsa and guacamole that amp up the flavour! 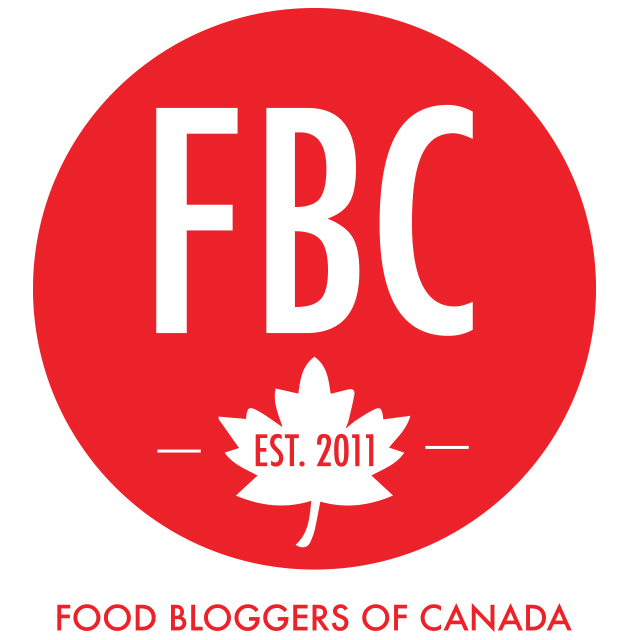 Happy to have discovered you Kimberley, since I have been pre-occupied for sometime with food sensitivities. Will be exploring your site and resources for sure. Three recipes here – thanks – will be trying this soon! Hi Diane! I’m also very happy that you’ve discovered my blog. 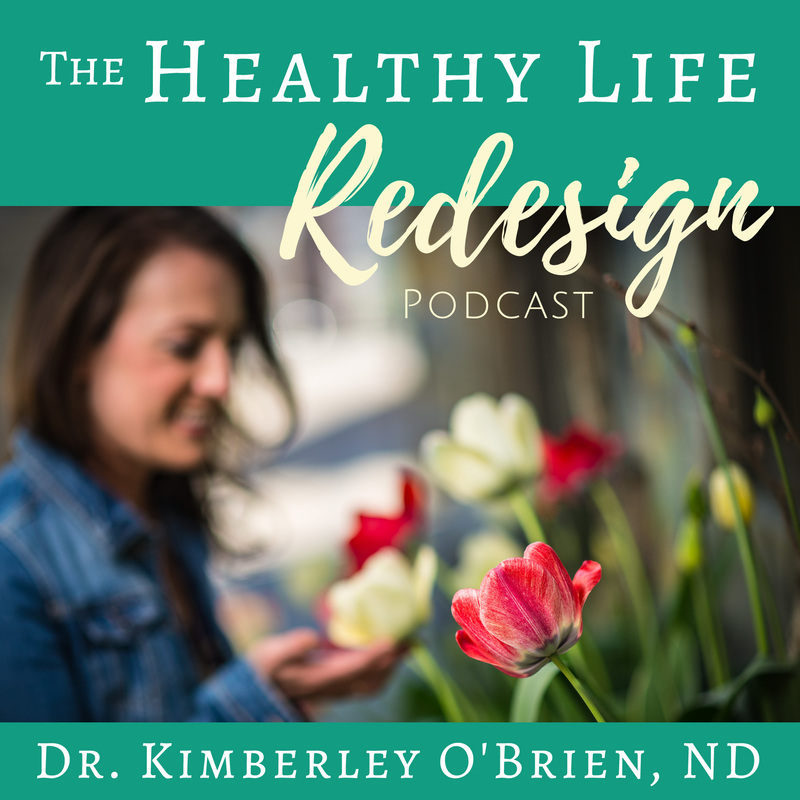 I hope all of the gluten and dairy-free recipes on Healthy Life Redesign will be a great resource for you! Many are egg, soy and corn-free as well. Please let me know if you have any questions in regards to your food sensitivities! Oh I am obsessed with Mexican food. We eat it out, we cook it at home. I’m not allergic to any food (that I know of!) but I’m down for anything that would help me avoid belly bloat. This is a lovely dish. We will definitely add this to our menu rotation. Thank you Jolina! Please let me know how it turns out! The interesting thing is that food sensitivities are actually what often leads to the bloating that follows many meals. Sensitivities are very different from food allergies, which occur immediately after exposure to the food and cause severe symptoms like swelling and anaphylaxis. Food sensitivities are a delayed immune reaction that lead to peoples chronic symptoms like bloating, IBS, headaches, acne, eczema, joint pain and fatigue. 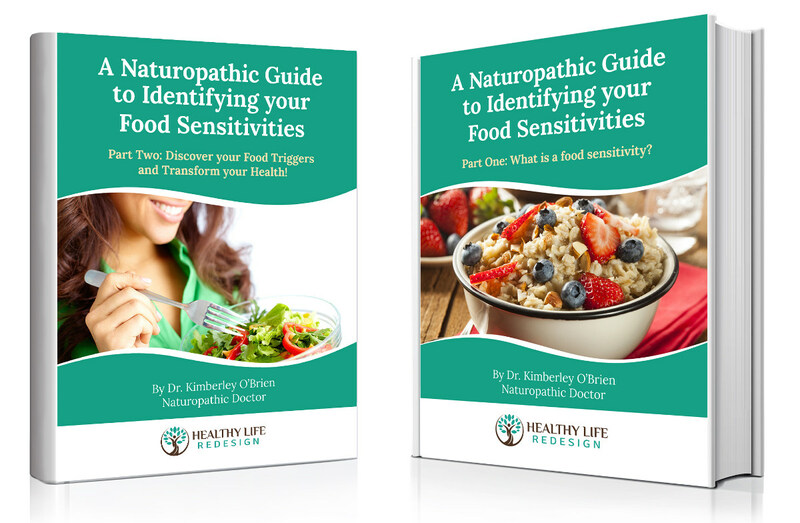 My free ebook series dives into identifying your food sensitivities in a lot more detail so if it interests you to investigate things further that would be a great resource!